Join us in Old Buckenham to Run in the Dark on 14th November 2018 and support our ongoing research to find a cure for paralysis in our lifetime. Your £21.50 donation will play a big part in helping the Mark Pollock Trust to reach its £440,000 fundraising aim. This year’s pop-up run will again be championed by Chris Clarke, from Belfast, who lives in Old Buckenham. In return for your donation, you will receive a run entry and a Run in the Dark flashing armband. Bottled water will be distributed to all participants at the finish line. Please bring cash if you wish to buy something from the pub. A group photo will be taken with all participants in advance of the run so please arrive by 6.45pm. For any queries relating to this event please feel free to contact Chris Clarke via email (csclarke76@gmail.com) or though the Old Buckenham village Facebook page (https://www.facebook.com/groups/oldbuckenham). The start and finish line will be located outside the Ox and Plough Pub. 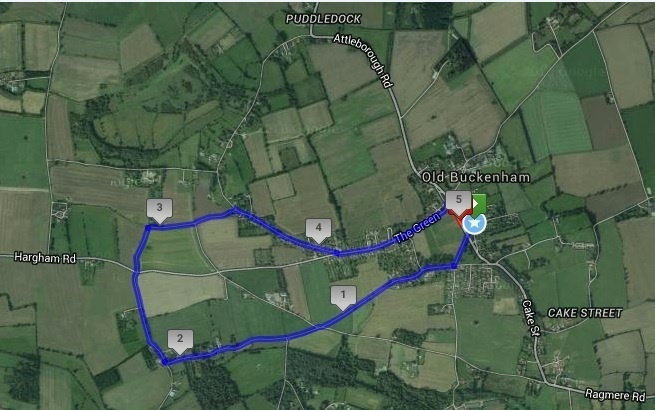 The 5km route will go past the Old Buckenham Windmill, through the village of Stacksford, along Fen Street and then back to the Ox and Plough Pub. Those wishing to complete 10km may loop around once more. After the race has finished all runners are encouraged to reunite at the Ox and Plough pub for the obligatory night cap and to raise a toast to Mark Pollock. Whether you are completing the 5km run or 10km run, please arrive at 19.30 (7.30pm) so that we can ensure everyone will receive their flashing armband and buff and have a group photo before we go running! There is some parking available outside Old Buckenham Church, or in the road onto Old Buckenham High School.